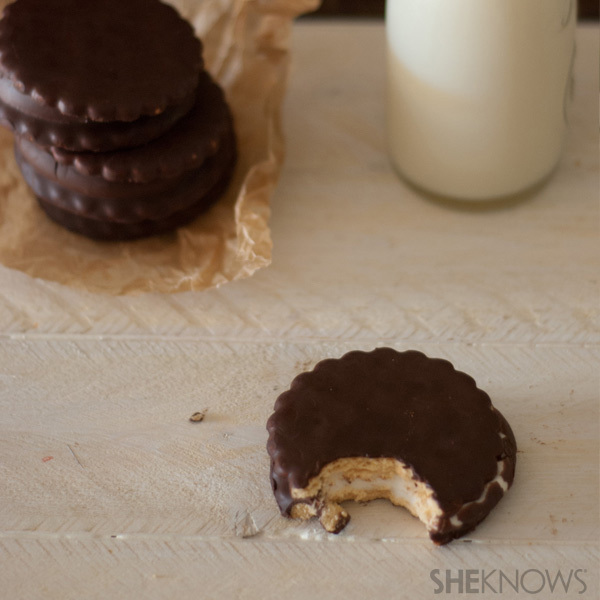 Retro cookies with a punch of flavor. Perfect dessert post-blood sucking for even the fullest vampire. Cream the butter until smooth. Add the sugar and continue mixing until well blended. Add the vanilla and mix until light and fluffy. In a separate bowl, stir together the cocoa powder, cornstarch and flour. Add the dry ingredients to the butter mixture and blend just until combined. Form the dough into a disk, wrap it in plastic wrap and chill at least two hours or overnight. On a floured work surface, using a floured rolling pin, roll the dough out to one-eighth-inch thick. Use flour-dipped cookie cutters to cut out 1-1/2-inch diameter circles and place them on an ungreased sheet pan, leaving one-inch between the cookies. Bake until crisp, 12 to 14 minutes and let cool on the pan. Put marshmallow cream into a pastry bag fitted with a round tip. Pipe a dab of marshmallow onto half of the cookies and top with the rest to make sandwiches. Let stand at room temperature for two hours. Melt chocolate and oil together in the top of a double boiler or a bowl set over barely simmering water, stirring occasionally. Line a cookie sheet with parchment paper or a nonstick baking mat. One at a time, gently drop the marshmallow-filled cookies into the hot chocolate and lift out with a fork and let the excess chocolate drip back into the bowl. Place on the cookie sheet and let set at room temperature until the coating is firm, about one to two hours.